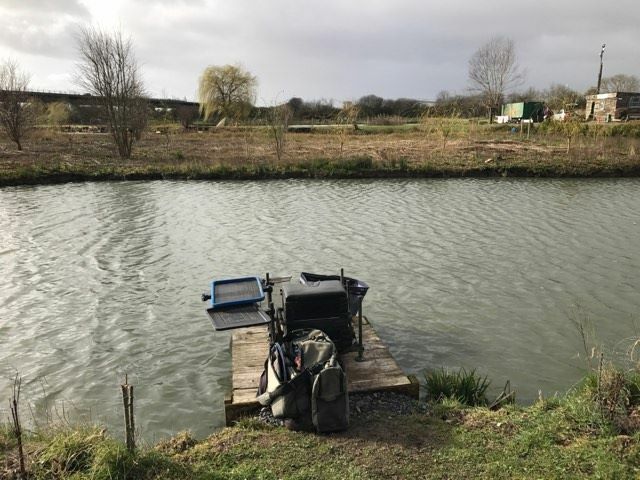 With our river matches finished now until October and the Summer league not starting until May, I booked into Summerhayes today. Janders was going to come as well as he hadn’t been fishing for ages but with the weather forecast not looking very good, he decided to give it a miss. Driving over to Bridgwater in the morning, it wasn’t looking too bad and I was hoping that the forecasters had got it wrong yet again. As I pulled into the car park the first people I saw were Ray and Nigel Wickham and of course I had some grief with them asking what I was doing there and was I lost, the usual kind of thing. It was nice to catch up with the regulars, who I hadn’t seen since last year and even Bruce and Heardy were there. Today’s match was a rover and you could pick any peg on any of the lakes, the only stipulation being that you can’t chose a peg next door to someone else. The golden peg was choice number four, and silvers maestro, Jeff Sparkes, pulled that one out, I had choice number three. Nigel Wickham had first choice and went for peg 13 on Willow, Bruce was next and chose peg 37 on Longs, then it was me and I didn’t really know where to go so went for peg 3 on Longs, it won Fridays silvers match with 10lb and I should have plenty of room, Jeff went for peg 12 on Sellicks. As soon as I saw my peg, I knew I’d made a mistake, the wind was howling down the straight and looking at Bruce on 37, he was fairly sheltered as were some of the pegs on the opposite side. I set up a 14 x 11 MW F1 Slim for ten metres and a 0.3 gram NG Mini Gimp for the five metre line, both rigs had size 16 Tubertini 808’s to 0.10mm. I was trying out some of the new Burt Baits Chocolate Orange range for the first time (look out for the review coming soon) and had some micros I’d soaked the night before and mixed up some of the groundbait which smelled divine! I also had some dead maggots and 4mm expanders for the hook. On the whistle I fed half a pot of micros on two lines at ten metres (straight out and angled to the left) and a ball of groundbait at the same distance but angled to the right and finally potted in some micros at five metres. I started straight out with a 4mm expander on the hook and after five minutes, the float sailed away and of course I missed it! Next chuck I had a 4oz skimmer and then a slightly smaller one but no more indications saw me try the left hand line for the first time, nothing there so I went over the groundbait and had another small skimmer but it was slow going. The wind was horrendous and I just couldn’t fish at ten metres, so I came in on the shorter line and hopefully it would calm down a bit later on, I started getting bites but only from little roach and then bizarrely the sun came out and I couldn’t see my float because of the glare so had to start another short line to the right, more roach followed before I had another carp and I really wasn’t enjoying myself very much. After about three hours, Ray wandered up and said he just couldn’t fish, he’d had a tench and lost one but was going to pack up, he said Nigel was catching silvers quite well. While he was with me, the float slid away and as soon as I struck I knew wasn’t a carp and sure enough a lovely tench of a pound or so popped up and he left me to it. As if the wind wasn’t bad enough, the rain went from being showery to chucking it down and my hands were so cold I was struggling to put bait on the hook. I was still getting the odd roach and small skimmer along with the inevitable carp but then I added another tench to put me on around 4-5lb of silvers and there were still two hours to go. I stuck at it thinking another couple of decent skimmers would put me on around 7-8lb and I didn’t think that would be far off today. I kept hooking carp that didn’t do a lot and I was convinced I’d hooked a skimmer or tench until they woke up. With half an hour left, I pricked a fish on the strike and a good skimmer leapt out of the water – great! That pretty much summed up the day and the only other action I had was a couple more carp. 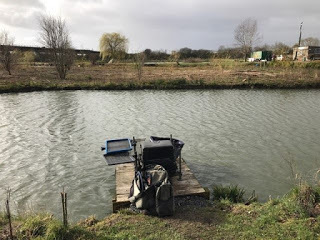 Pete shouted the all out and I had a cup of coffee to try and warm up before packing my kit away and I was relieved to just get through the match without any pole breakages or losing any kit. My final tally was two tench, two decent skimmers and around a dozen smaller ones plus a few roach and about ten nuisance carp. I took my kit back to the car and caught up with the scales on Lily where Heardy had weighed 45lb of carp and John W had 57lb 1oz from peg 10 to set the pace. Mark Leahy had 35lb 2oz of carp on Willow and then Nigel Wickham had 12lb 2oz of silvers from peg 13. 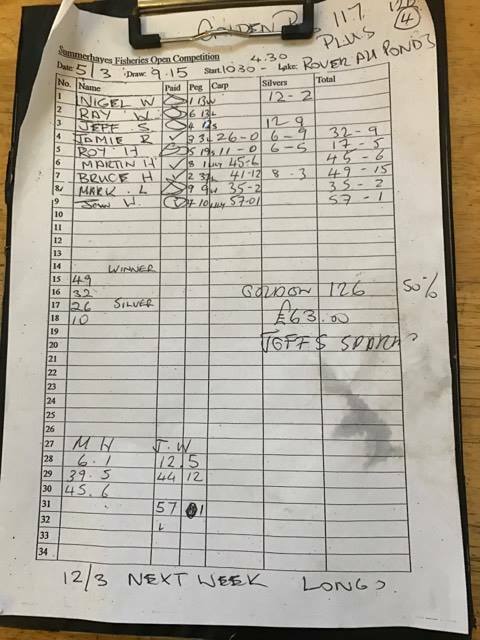 Jeff Sparkes was admitting to 8-10lb of silvers so I knew there was no chance of a pick up today but after sitting out in that weather for six hours, I was weighing in! 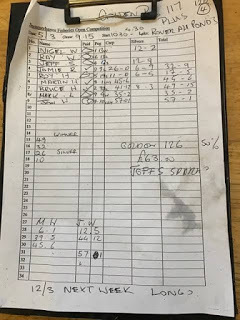 My carp went 26lb and then my silvers weighed 6lb 9oz which was a little more than I thought but even if I’d had the two good skimmers, I’d bumped, it wouldn’t have been enough. Then Bruce had 41lb 12oz of carp and added 8lb 3oz of skimmers to give him 49lb 15oz and put him in second place. Last to weigh were Roy Hughes who had 6lb 5oz of silvers and 11lb of carp from peg 19 on Sellicks and then Jeff had 12lb 9oz from peg 12 to pip Nigel and take home a nice bonus as he was on the golden peg. So not a very nice today and I hadn’t done myself any favours by choosing that peg, let’s hope the weather is better next weekend!